Royal Pine Pollen Tincture is also available in a 4 ounce bottle. This is a propitiatory, clinical grade true dual extract of fresh, RAW Pine Pollen. The large 4-ounces bottle contains 59 full servings. RAW Forest Foods' unique 1:2 true dual extraction process results in the strongest tincture available, made from select wild harvested and ecologically cultivated herbs, ensuring our customers with what we truly believe to be the highest quality tincture available anywhere. Our clinical grade Royal Pine Pollen Tincture is also available in a 4 ounce bottle. 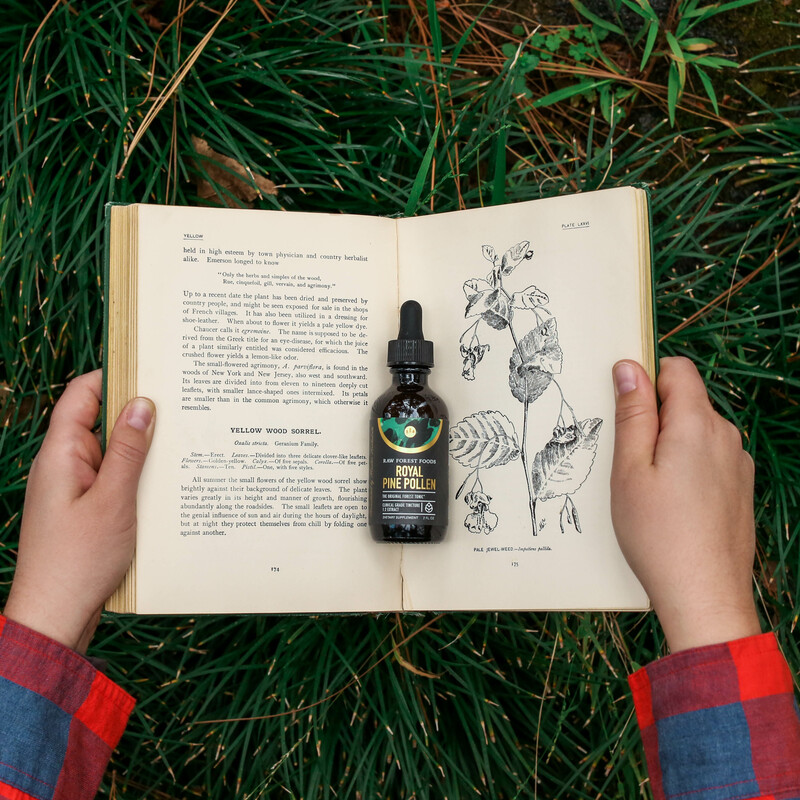 Additionally, Pine Pollen Tincture can be found in our Elevated Pine Pollen Tincture (with Nettle Root, Chen Pi, and Zhi Zi), Endocrine Strengthening Formula Tincture, and our Eros' Arrow Aphrodisiac Elixir Tincture. View our full product line of Mountain Harvest Pine Pollen. For those seeking the benefits of Pine Pine Pollen but without the pro-androgenic nature, please see our RAW Brassica Pollen, RAW Camellia (Green Tea) Pollen, and our RAW Sacred Lotus Pollen. Each bottle contains either 2 or 4 ounces of our Royal Pine Pollen tincture. This tincture, like all of our tinctures, are professionally prepared in our domestic, certified organic, FDA cGMP facility. All of our tinctures are extracted using pharmaceutical grade alcohol and are bottled in opaque glass bottles to protects the ingredients from damage and degradation by UV rays. This tincture is extracted to a 1:2 ratio, making it the strongest available. Learn more about our tincture processing here. As an alcohol-based tincture, the active compounds present are able directly to cross the cell membrane and enter the blood supply immediately, unlike our Pine Pollen Powders which must be digested. Pine Pollen Tincture deviates from the nutritional aspect of RAW Pine Pollen and focuses on the phytochemicals present within it, specifically the phytoandrogens (plant hormone analogs) androstenedione, androsterone, dehydroepiandrosterone (DHEA), and testosterone. These androgens may help raise levels of free testosterone in the body. For customers seeking the full range of health benefits from Pine Pollen, while also raising testosterone levels. we recommend a combination of our RAW Pine Pollen with Pine Pollen Tincture. This is a professional grade tincture and is intended for therapeutic use—not abuse. Suggested Use 2 mL (approximately 2 droppersful), taken as needed. Dosage may be broken up throughout the day into two servings: One dropper in the morning and one dropperful before bed). 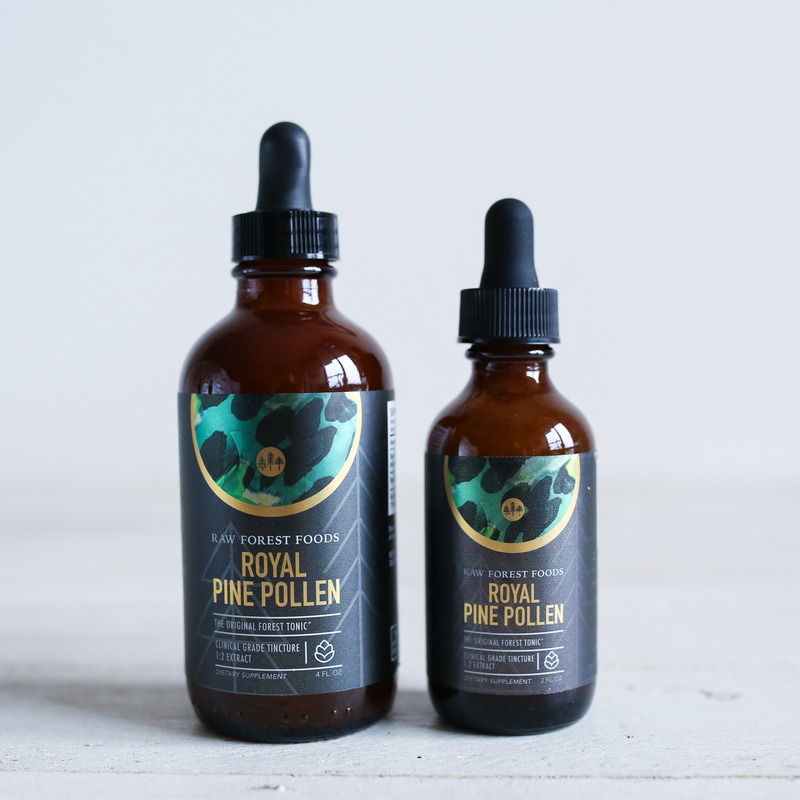 In each 2 ounce bottle, there are approximately 29.5 servings of Royal Pine Pollen Tincture. Extracted at a 1:2 ratio, each dropperful of tincture contains an equivalent of 1.0 gram of fresh, raw herbs per serving. We have worked hard to offer you this clinical grade Endocrine Strengthening Formula Tincture as part of our full line of Mountain Harvest Pine Pollen. It is a full 1:2, true dual extract, made professionally using fresh, RAW Pine Pollen, in a domestic, FDA cGMP facility, ensuring you an unrivaled (in quality and in potency) tincture. 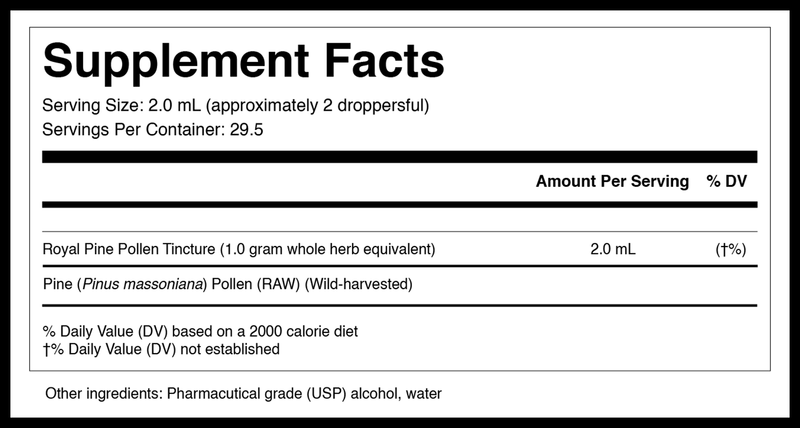 Exit analysis: Royal Pine Pollen Tincture (4 Ounce). I first ordered Raw Forest's pine pollen tincture several years ago and had *amazing results. My well being, stability, and body structure improved within days. The bio-identical testosterone in pine pollen makes a huge impact on my life. I personally hold the tincture under my tongue for 2 minutes for best absorption. I recently ordered again, and the product is as great as ever! Amazing product! Felt the effects almost immediately! More energy more motivated and better workouts thanks again for making such a great product! Plus the best customer service you could ask for there's not a company out there that will take better care of you! Thanks again you guys are awesome!!! I have been using the Pine Pollen Tincture along with the Pine Pollen Extract powder for about 1 month. Noticeable increase in libido, firmness and endurance. I have been taking Pine Pollen Tincture (2 Ounce) (2:1 Extract) as well as Pine Pollen Extract (10:1) exactly following the dosage instructions on the package for 4 days now and I am waiting for this BIG difference everyone is writing about. I may have slightly more energy, but no difference in my wood. I have been taking the pine pollen tincture for a little over a month, and it is HIGHLY effective. I am an athlete, and have taken every supplement available over the years, and nothing even comes close to pine pollen. The testosterone boost is very obvious as well as increased energy. I take a high dose of the tincture, and stack it with Raw Forest Foods pine pollen powder. Excellent products! This is my third time buying the product, and I will continue to buy the pine pollen tincture. Excellent product! There's alot of information on the bottle! Next time I will buy a bigger bottle.